It came down to the lack of a second. After hearing pros and cons from more than a dozen city residents — including two former city commissioners — four of the current Sarasota City commissioners chose not to hold a referendum this fall on moving the city elections from the spring to November. 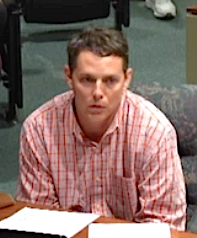 After about 75 minutes of comments from City Attorney Robert Fournier, remarks by members of the public and a few minutes of discussion on April 18, Vice Mayor Suzanne Atwell made a motion to approve the scheduling of the referendum on Nov. 8. When Mayor Willie Shaw asked for a second, silence ensued. Then Shaw moved on to the next agenda item. The public hearing on the city elections referendum was the second the City Commission has held this year; the first was on Jan. 19. Every time the board has considered the matter, Commissioner Susan Chapman pointed out on April 18, more concerns have arisen. That night, she continued, the fact that the state has not certified any software for instant runoff voting (IRV) and the potential for “an unpopular candidate” to win a plurality of votes — and, therefore, a seat on the board — were yet two more issues to consider. “Every time we have a meeting on this, it gets more complicated,” she reiterated her point. In response to several speakers’ pleas that the board appoint a Charter Review Committee to vet all the facets of an election date move and then make a recommendation, Commissioner Shelli Freeland Eddie asked Fournier about the process for establishing the committee. He told her, “It’s an option at any time.” The commission can appoint members and direct them to restrict their deliberations to a specific topic, Fournier added. 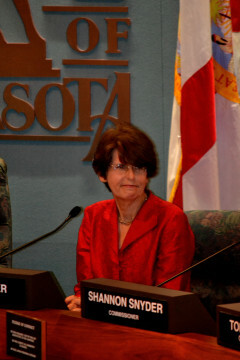 With Fournier having explained earlier that the City Commission would have to adopt an ordinance setting the referendum no later than 90 days prior to the Nov. 8 election, Commissioner Liz Alpert asked whether a Charter Review Committee have sufficient time to consider the election move and offer its advice. “You would not want to rush a Charter Review Committee,” City Auditor and Clerk Pam Nadalini added. 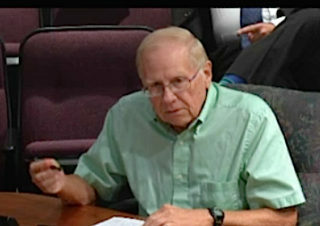 Eddie also asked whether Kafi Benz, president of the Sarasota County Council of Neighborhood Associations (CONA), was correct in her public comments about the fact that the city no longer would have any authority to canvass votes cast in the city elections if the city races were put on the November general election ballots. “My understanding is that is correct,” Fournier responded. 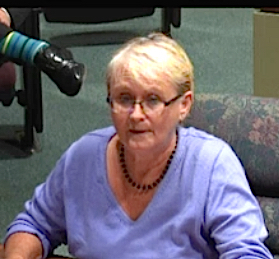 Nadalini confirmed that, adding that she had spoken with Sarasota County Supervisor of Elections Kathy Dent. However, Nadalini said, city representatives could attend the canvassing of all votes. When the City Commission reached Agenda Item No. XII.A.1. on April 18, Fournier explained that the board’s Jan. 19 public hearing focused on two alternative proposed ordinances. Both called for scheduling a referendum on the question of changing the date for the city elections from the spring of odd-numbered years to November of even-numbered years, to coincide with elections for federal, state and county offices. The first alternative called for a referendum on moving the elections but retaining the current system of a runoff if no candidate won a majority of the votes in the first round. Under that proposal, the first election would be held at the same time as the partisan primaries for other elections — in late August or early September — but only in those years when more than two candidates qualified for a race. Fournier also pointed out during the meeting this week that the City Commission would retain its three district seats and two at-large seats. The City Commission voted 3-2 on Jan. 19 to go with the second alternative: no runoffs. Shaw and Chapman were in the minority. 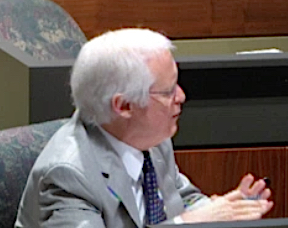 Fournier explained on April 18 that at that time, staff was not sure whether the Florida Legislature would approve a bill that would pre-empt the City Commission’s efforts to move the elections. 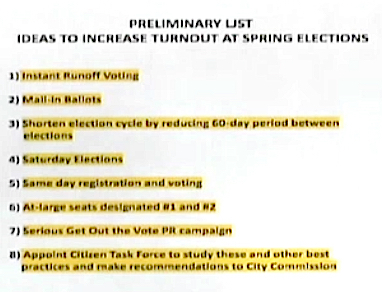 If such legislative action did not follow, Fournier added, the City Commission vote in January had made it clear a second public hearing would be held in April on scheduling a referendum on the no-runoff alternative. Therefore, with the Legislature having passed no bill that affected the city elections, Fournier said this week, the second public hearing was put on the April 18 agenda. During the April 18 public hearing, former City Commissioners Kelly Kirschner and Richard Clapp were among those who urged the board not to proceed with the referendum. Kirschner pointed out that if the new system had been in place last year, neither Freeland Eddie nor Alpert would have been elected, as they did not win their seats until the runoff was held in May. “Someone with less than a majority would be sitting where you are today,” he told them. If the elections are moved to November, he continued, “probably, with a decent amount of frequency,” people will be elected with pluralities instead of majorities. Furthermore, Kirschner said, a November election cycle will lead to “an abundance of a flood of cash in [these races],” because they will coincide with county, state and federal elections. Yet, several years ago, he noted, 88 percent of the registered voters in Sarasota approved campaign finance reform for city elections. Kirschner added that 75 percent of the 53 largest cities in the United States hold their elections either in the spring or in November of odd-numbered years. In Florida, 65 percent of cities the size of Sarasota do the same, he noted. A Charter Review Committee appointed by the City Commission considered a proposed change to the election cycle during meetings in 2010 and 2011, he said, and it chose not to recommend the switch. Art Levin, who told the board he served on that Charter Review Committee, explained that during the general election in November 2010, because of the number of proposed state constitutional amendments, the city races would have been on the second or third page of the ballot. Statistics have shown that races near the ends of ballots garner less voter participation than those near the top, he added. Yet other speakers urged the commissioners to hold the referendum. Matt Wooddall, who ran in the 2015 race for the District 3 seat, cited the expense of the March elections and runoffs in May. If a runoff is necessary, he said, the total cost to the city is $120,000 for the two voting days. In November, he noted, the expense would be $12,000. “There is a fiduciary responsibility … that must be considered,” he added. Diana Hamilton, who called herself a “super voter” because she has never failed to participate in an election, suggested the turnout in November would be three to five times higher than it is in March. Data The Sarasota News Leader researched on the Sarasota County Supervisor of Elections website shows that for just the last three city elections in March, voter turnout ranged from 17.78 percent in 2011 to 21.87 percent in 2015. Runoff turnout ranged from 14.81 percent in 2011 to 18.7 percent in 2015. Conversely, voter turnout in the past four general elections has ranged from 56.1 percent in 2010 to 80.07 percent in 2008. During the board’s discussion after the public comments, Commissioner Chapman talked of research she had undertaken into voter participation. The Pew Research Center — “which is very respected,” she noted — has reported that people are most likely to vote if they are irritated about an issue on the ballot.